The Indian Air Force today celebrated its 86th anniversary. A scintillating air display by various aircraft was the hallmark of the Air Force Day Parade at the Air Force Station Hindan in Ghaziabad. However, the star of this year’s celebrations was the Dakota DC3 aircraft that made it’s maiden appearance in the Fly Past. The Indian military aircraft, which played a vital role in the 1947-48 India-Pakistan war and other wars, was restored to its original glory, made in flying condition by Rajeev Chandrasekhar and was inducted in to the Vintage Aircraft Flight of the Indian Air Force in May this year. This aircraft was gifted to nation by Rajeev Chandrasekhar and was named Parashurama by him. MP Rajeev Chandrasekhar is an aviation enthusiast and is the son of an Air Force Officer Air Commodore M.K.Chandrasekhar who served as Trainer of Fighter Aircraft who flew Dakota and was part of several sorties of Dakota as well. Speaking on IAF Day 2018, Chandrasekhar said “I am delighted see the Dakota participating in it’s maiden fly past. The Dakota is an important part of Air Force’s history - and J&K history. If it was not for the Dakotas and the troops it airlifted in 1947 - Srinagar would not be with India today. The restoration took over 6 years and cost me a lot of money. But I was motivated mainly for my father and many others who served and the need to remind country of the bravery of IAF and Army in 1947 which kept young independent India together with J&K. On 13 February 2018, Rajya Sabha MP Rajeev Chandrasekhar gifted the Dakota bearing the Tail Number VP 905 and called “Parashurama” in a signing ceremony to The Indian Air Force to be added to its Vintage Fleet. The Gift Deed was signed between Air Chief Marshal Birender Singh Dhanoa , PVSM, AVSM, YSM, VM, ADC , Chief of the Air Staff of the Indian Air Force and Air Commodore M K Chandrasekhar, VM, VSM (Retd)- Rajeev Chandrasekhar’s father who an Dakota Pilot himself. The aircraft commenced its journey from the UK on April 17 to India with and flew a total of 9,750 km during its ferry en-route halts in France, Italy, Greece, Jordan, Bahrain and Oman and landed on Indian soil on 25 Apr 18. Dakota DC3 VP 905 Parashurama was formally inducted into the IAF Vintage Flight on 4 May 2018 in a grand ceremony at Air Force Station Hindan where Air Cmde M K Chandrasekhar (Father of MP Rajeev Chandrasekhar), a veteran Dakota pilot himself, handed over a symbolic key to the Chief of Air Staff Air Marshal B S Dhanoa. 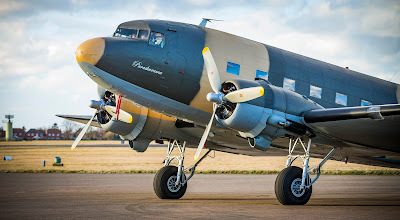 The Dakota D3 was at the forefront of operations from 1947 to 1971 and played an indispensable role in logistics and transportation during its flying years in the IAF. The Dakota was deployed by to fight Pakistan army aided by an irregular militia consisting of tribesmen from the frontier invaded Kashmir in 1947. The Dakota was put to good use during the Indo China war of 1962 and also during the India Pakistan war in 1971. The crucial para-drop operations in Tangail, 60 miles from Dhaka, on 11 December 1971, four days ahead of Pakistan military’s historic surrender to the India-Bangladesh Joint Command on December 16 were done from a Dakota.